As a teacher and a Trekkie, I can’t help but notice the philosophical similarities between us in the field of education and Starfleet. We have genuine belief in the value of our work, and this causes us to be ridiculously optimistic. We can be preachy, obsessed with our field, and well… nerdy. Perhaps it’s my inability to shut off my teacher brain that has led me to notice these similarities and use them to make me more socially conscious and ethical in my work. Like many members of Starfleet, I started my career in my native San Francisco, and went off on a mission of discovery and diplomacy with stars in my eyes. The further I got from home and the more years I spent in my field, the less I felt like a starry-eyed ensign and the more I felt like an embattled security officer. In New York, I taught a poetry course specifically targeted at students who were deemed “at risk” of dropping out of high school, then moved on to East London where one could assume a student or two will be involved in a knife crime in a given year. These schools have been culturally diverse, full of individuals as beautiful as they are unique, and not dissimilar to war zones. On more than a few occasions I have gulped raktajino-strength coffee and felt immense camaraderie with the struggles of Keiko running the one-room schoolhouse on DS9. 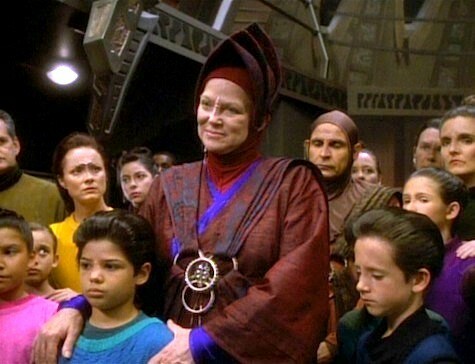 Beyond the everyday battles of behavior management that make me feel more like an Odo than a Keiko, however, is the reason I come to work every day: To educate young people, so the future of our species is better than our past. This is why I’ve chosen to venture so far beyond my hippie comfort zone, to avoid preaching to the choir and challenge the structures that keep people, particularly impoverished immigrants and their descendants, at the bottom of the social ladder. There is true brilliance in Keiko’s understanding of the role and responsibilities of a teacher in the community. She shows patience and empathy and exercises the Prime Directive (we teachers use this in real life; we call it cultural relativism) when the Bajoran children ask about the Prophets, and clearly states that she “respect[s] that the Bajoran people believe” in the Celestial Temple, while maintaining those firm boundaries with Winn. As a teacher, I recognize her insistence that we are not diplomats, and we cannot change facts for the comfort of others. We can, however, validate the home cultures of our students and model the behavior of a responsible member of the community through these boundaries. Keiko has been my model of professional poise many times in my career. A few years ago I found myself paraphrasing her lines during a meeting with a mother from Ghana, who was concerned that I was exposing her daughter to evil by teaching about the cultural context of witchcraft before we began reading “Macbeth.” As a queer woman who wears a lot of black, I was as disturbed by her very real fear of witches as I believe she was about my curriculum. Ultimately I had to let her daughter skip the homework in which she did independent research on the topic, but by being empathetic, professional and somewhat firm, I did assure her that I am not going to be teaching her daughter actual black magic, thus building the foundation for a bridge between our cultures. I tell my students that we look to fiction to make sense of the world around us and imagine how that world could be changed or point out what needs changing. For many of us, Star Trek has been one of those fictional worlds that has empowered and inspired us. One of the many reasons I love my job is that I have the privilege of opening doors to new worlds for my students, and hearing their responses during their exploration of literature, whether they are critical or full of wonder, is a reward I’ll never be able to put into words.